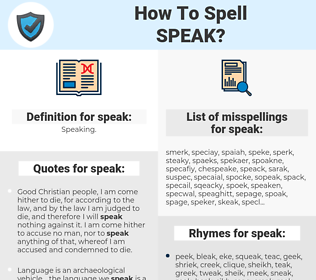 What are the misspellings for speak? 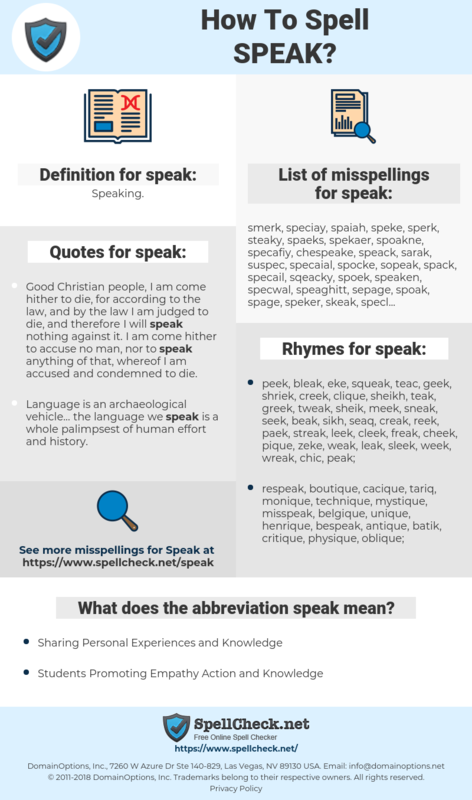 What are the common mistypes for speak? What is the definition of speak? What does the abbreviation speak mean? What are the quotes for speak? What are the rhymes for speak? What are the translations for speak? What are the common typos for speak? This graph shows how "speak" have occurred between 1800 and 2008 in a corpus of English books. Good Christian people, I am come hither to die, for according to the law, and by the law I am judged to die, and therefore I will speak nothing against it. I am come hither to accuse no man, nor to speak anything of that, whereof I am accused and condemned to die. Elvis said, Miss Minnie, do you think it would be out of order if I go up and speak to General Stewart? I've always been such a fan of his. So Elvis went up to speak to the Stewarts. The world does not speak. Only we do. The world can, once we have programmed ourselves with a language, cause us to hold beliefs. But it cannot propose a language for us to speak. Only other human beings can do that. 讲, 谈, 出言, 说上, 做声, 出口, 曰, 口称. dire, communiquer, exprimer, parler, prendre la parole, faire un discours, prononcer une allocution, intervenir. aussprechen, sagen, reden, sprechen, speak. 話す, スピーク, くちをきく, 口をきく, 言い出す, つむぐ, くちばしる, 紡ぐ, 口を利く. dizer, falar, palestrar, pronunciar-se, exprimir-se, ser orador, dar opinião, fazer discurso, proferir um discurso. decir, articular, hablar, tala, orar.